Haemovit Plus is a unique, specialised supplement which helps provide essential nutrients needed for the formation of healthy blood cells and a strong immune system. It is rich in Iron, Vitamin B12, Zinc and Copper to help build a strong body defence. Optimum care for people with special nutritional needs. 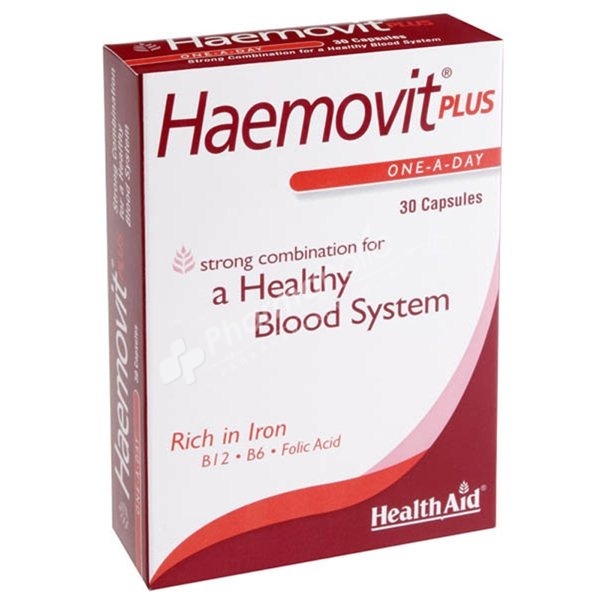 Haemovit Plus Capsules are specially formulated to provide vital nutrients needed for the formation of healthy blood cells and a strong immune system. Rich in Iron, Vitamin B12, Zinc and Copper to help build a strong body defence and boost the nervous system. Optimum care for people with special needs. Suitable for men and women. Yeast free, Gluten free, Wheat & dairy free, Artificial colours free, Preservatives & Flavourings free. Allergy Information: This product contains soya. Adults and children over 12 years of age, one capsule daily with food. Soybean Oil, Vitamin B12 prep (calcium phosphate, cyanocobalamin), Ferrous Fumarate, Gelatin, Ascorbic Acid, Glycerine, Vegetable Fat, Sunflower Lecithin, Yellow Beeswax, Manganese Sulphate, Pyridoxine HCl, Copper Sulphate, Zinc Oxide, Natural Colour:( Red Iron Oxide), Folic Acid. Haemovit Plus capsules should be taken with food to avoid stomach irritation due to the high Iron content.